A Full Bench of the ERD Court has made its ruling in the third party appeal of Paior v Marion & Fleetwood, quashing a retrospective planning consent issued by the Council. The decision is the latest chapter in a long running dispute about a two-storey dwelling and other works constructed in 2013 in the face of legal proceedings. 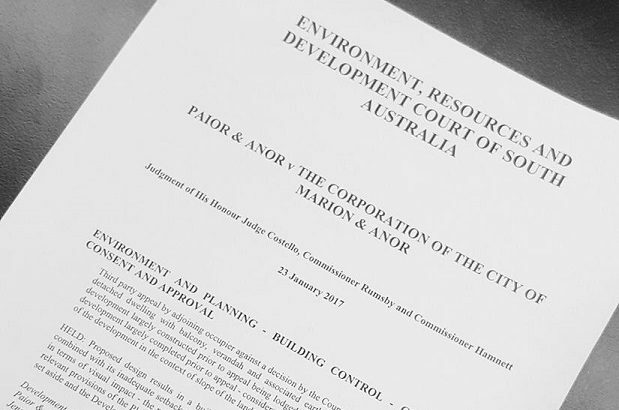 After the Paiors’ successful legal challenges to planning consents issued by the Marion Council in 2012 and 2013, the proposal was re-processed as a Category 3 development. A further planning consent was granted by the Council in 2015, which led to this third party appeal by the Paiors as representors against the proposal. This was the first time that the Court was called upon to consider the merits of the proposal. 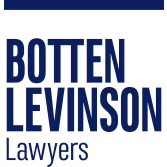 The Court found the impacts of the proposal to be unacceptable having regard to height, bulk, scale, set-backs and the potential for overlooking. As a consequence the Court quashed the consent. This is now the third development plan consent for the proposal which has been quashed. As a result, the development does not have any valid approval and may need to be demolished. The approval of a subdivision and subsequent creation of an allotment does not, in and of itself, create a right to erect a particular form of building. Where a Development Plan calls for an assessment against natural ground levels and those levels are readily ascertainable, they will be used over the existing levels. The gradient of land is properly calculated perpendicular to the prevailing slope contour. Landscaping should not be relied upon to render appropriate a proposal which is otherwise inappropriate. Side and rear setbacks are one of the “basic building blocks” of neighbourhood amenity. The fact that one of the impacted and overlooked properties was also owned by the Fleetwoods was largely irrelevant. The Court did not make any finding about what form of development would be acceptable on the site. For further information please contact Tom Game on 8212 9777.